Over the next few days here and on social media (follow me on Twitter), I'll be sharing some of my favorite websites. Enjoy! 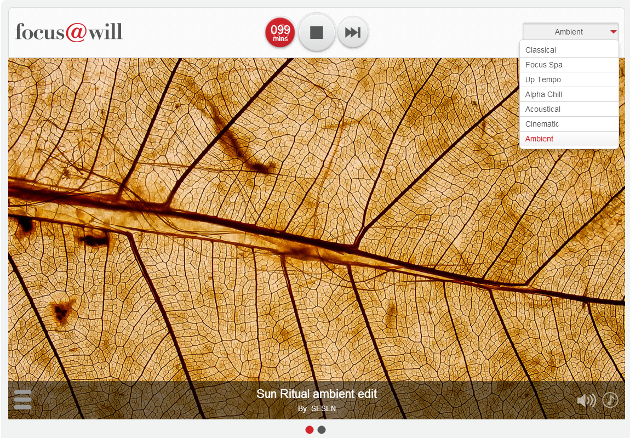 Focus@Will, pronounced as "focus at will," streams music designed to help you focus. All the tracks it plays are lyric-free. The site has different styles of music, or stations, such as cinematic, spa, ambient, and others. The idea is that the music is designed to minimize distractions and help you keep your eyes on the task at hand; in other words, you listen to it while you're at work. Certainly, a lot of people already listen to their favorite playlists while they work, and still manage to focus, and to them I'd say Focus@Will is probably not for you. If you already have a listening routine that enables or enhances your productivity, so be it. But if you could use something to help cancel out distractions from your environment, it's well a worth a shot. For $3.99 a month, you can add some special features to your Focus@Will account, but I say pass on that. The features aren't that great, and you can get what you need out of the free version.